Coursera has made incredible strides in increasing access to education for learners all over the world. From open courses and Specializations to MasterTrack™ Certificates and full degree programs, we work with more than 190 top universities and industry partners to help more than 40 million learners gain the knowledge, skills, and credentials they need to succeed in their careers. Degrees continue to be the most valuable credential for career and economic mobility, and I’m proud of how the Coursera platform has been able to provide access to top quality degrees at a highly affordable cost. Today, at our annual Partners Conference, I’m thrilled to announce two new degrees from the University of Colorado Boulder—bringing the number of degrees announced on the Coursera platform to 14. The University of Colorado Boulder will launch a Master of Science in Electrical Engineering (MS-EE) on Coursera and is pursuing a Master of Science in Data Science (MS-DS)*. Admission to both degrees is performance-based, so there are no prerequisites or an application. Students simply need to pass a series of courses for admission to the degree program. It’s inspiring to see how far Coursera has come in the past year. Since our 2018 Partners Conference, we’ve launched five new degrees on the platform. In addition to the two degrees with the University of Colorado Boulder, we announced a Master of Science in Machine Learning from Imperial College London, a Global MBA from Macquarie University, and a Master of Computer and Information Technology from the University of Pennsylvania. 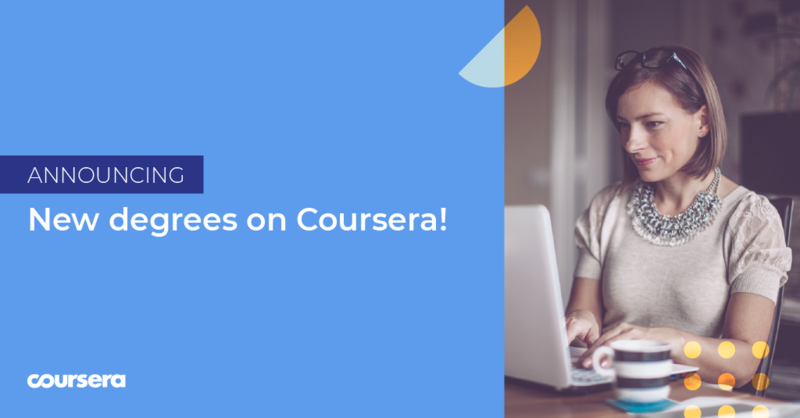 Coursera is also committed to providing a variety of higher education pathways to meet the diverse needs and goals of every learner. At this year’s Partners Conference, we announced an expansion of our MasterTrack™ program portfolio, including a Spatial Data Analysis and Visualization MasterTrack™ program from the University of California, Davis* that is in active development. Coursera’s MasterTrack™ program breaks portions of master’s programs into modules, so students can earn a university-issued credential online at a breakthrough price. Students who complete a MasterTrack™ program and are admitted into the university’s related master’s program can have their progress count towards the degree. In an era of rapid change and evolving skills, degrees and credentials are key to career advancement. We look forward to continuing to work with our world-class partners to build high quality, flexible, and affordable degrees and credentials of the future. * The Master of Science in Data Science degree is subject to final approval by the University of Colorado and the Spatial Data Analysis and Visualization MasterTrack™ program is subject to final approval by the University of California, Davis.